Moderate moisture to dry. 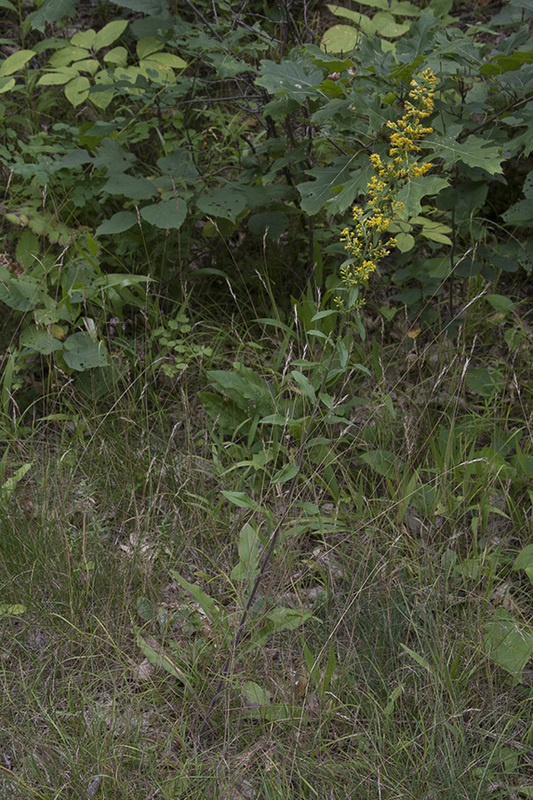 Woods, roadsides. Full or partial sun. This is a 8″ to 40″ tall, erect, perennial forb that rises usually on a single stem from a branched caudex. It usually does not produce rhizomes and it does not form clumps. 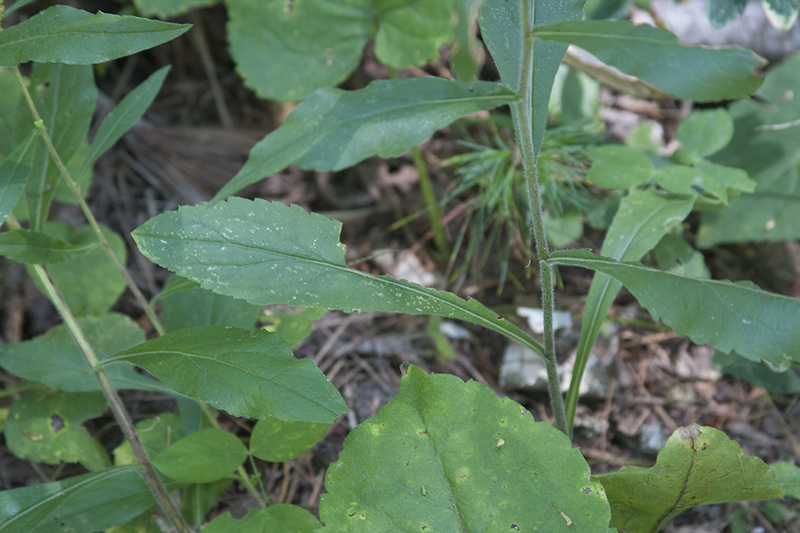 The stem is erect, unbranched, and leafy, with several fine, longitudinal ridges or grooves. It is moderately to densely covered with spreading hairs. Occasionally, the hairs are mostly appressed. Stem leaves are alternate. Basal and lower stem leaves are attached to the stem on a long winged leaf stalk (petiole). They are 2⅜″to 8″ long including the leaf stalk, and ½″ to 2⅜″ wide. The leaf blades are broad, inversely lance-shaped to inversely egg-shaped, with the attachment at the narrow end, or elliptic. They are tapered to the winged petiole at the base and taper to a sharp point at the tip with straight sides along the tip. There is one main vein. The margins may have sharp, forward-pointing teeth or rounded teeth, or they may be almost untoothed. The upper and lower surfaces are moderately to densely covered with spreading hairs. Occasionally, the hairs are mostly appressed. Basal leaves are usually present at flowering. 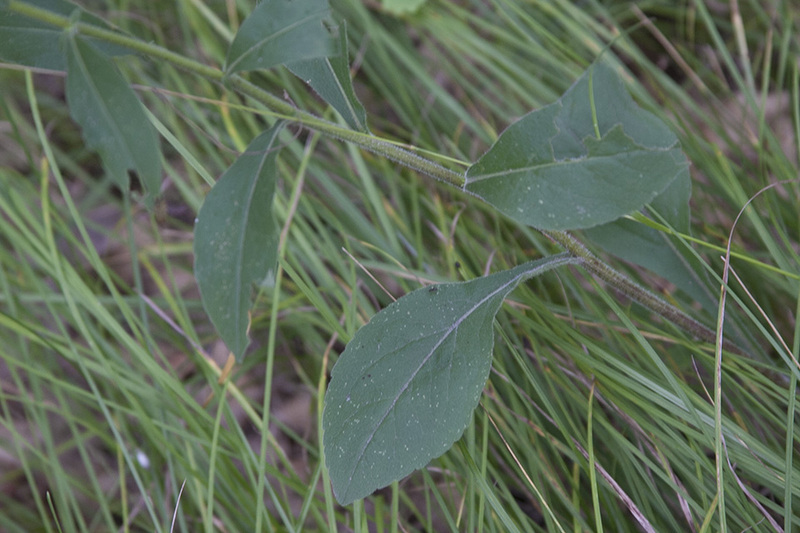 There is often an additional rosette of basal leaves on the ground near the stem. 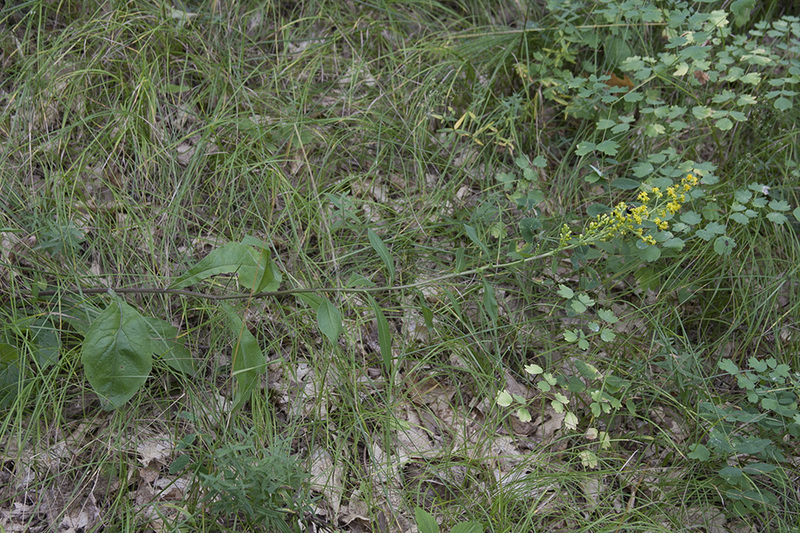 Middle and upper stem leaves are lance-shaped to elliptic or inversely egg-shaped. They are ⅝″ to 3″ long, becoming rapidly smaller as they ascend the stem. They are attached to the stem without a leaf stalk. The margins on the leaves neat the top of the stem are untoothed. The inflorescence is a branched cluster of short, unbranched clusters (racemes) rising from the upper leaf axils. The close spacing of the upper leaf axils and the shortness of the racemes combine to give the inflorescence the appearance of a spike at the end of the stem. 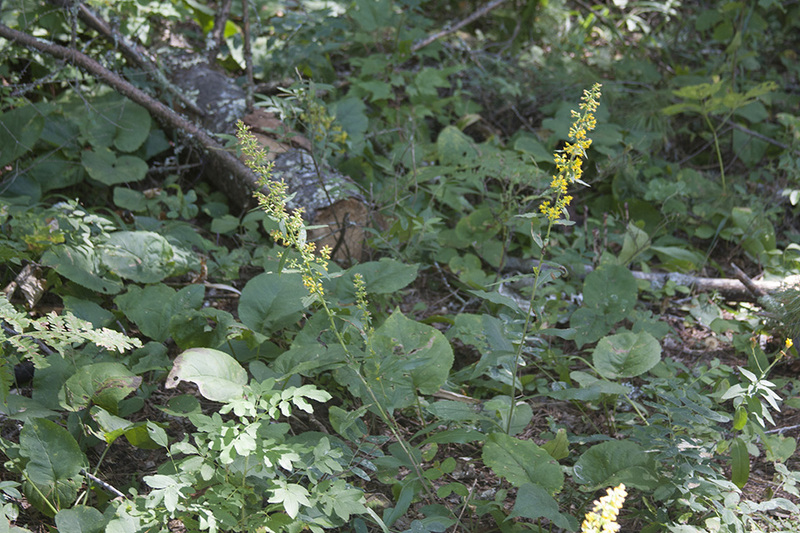 This false spike can be 10″ or more long and have 8 to 250 or more flower heads. The flower heads in the the racemes are oriented in several directions. 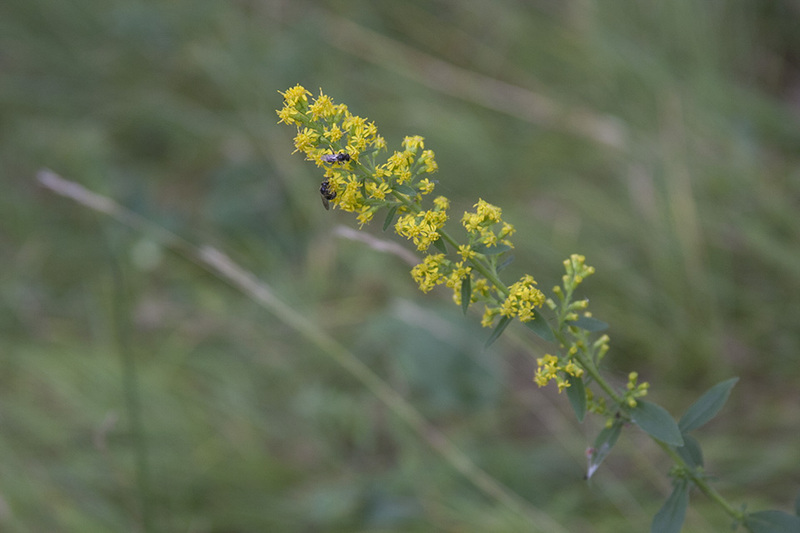 The flower head has 6 to 14 yellow ray florets and 6 to 12 yellow disk florets. A short, sometimes woody, persistent stem, at or below ground level, from which aerial stems arise each year.